Besides our wedding dress, every girl dreams of having her perfect dream closet. It’s only fitting right! Where else would we put that dream wedding dress anyways? 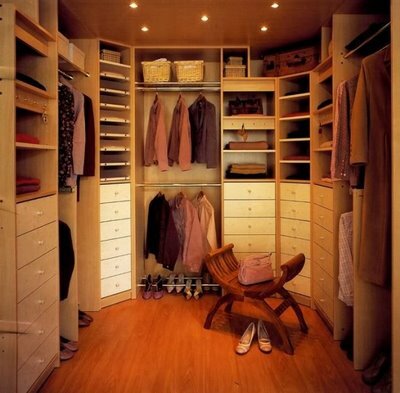 Like a man and his car, I’d say a closet is a girl’s baby. It requires regular cleaning, maintenance, new pieces to keep it going and personalizing. Whether you’re the simple type, the over-the-top fashionista or classic is your moto, there’s a closet for every gal out there. Personalize it, put your name on it and make it your own. With all those shopping trips, your buys do need a place to stay. So what’s your closet personality? See some of my finds to find out your closet personality. She never stops working. She gets in and the work continues. Where else to have her office, but the closet. She’s a high-end lady with an expensive taste and settles for nothing less. No fussy buiness for this gal. A grande lady who makes shoppings trips apart of her daily routine. Now this is what you call ‘shoe heaven’. Shoes are her bestfriend. She’s sophisticated, well-known and well dressed. She’s pretty simple, but never boring. She neatly colour-coordinates everything. Safe to say she’s obsessed. A closet made for a gentleman.